Vegetable tanned cowhide leather. Unlined. With a small sewn-on compartment inside (21 x 9.5 cm). Two locks and four snap fasteners, matt nickelplated. W 41 x H 29 x D cm (folded 41 x 16.5 x 4 cm). Weight 760 g.
Designed for couriers and musicians. 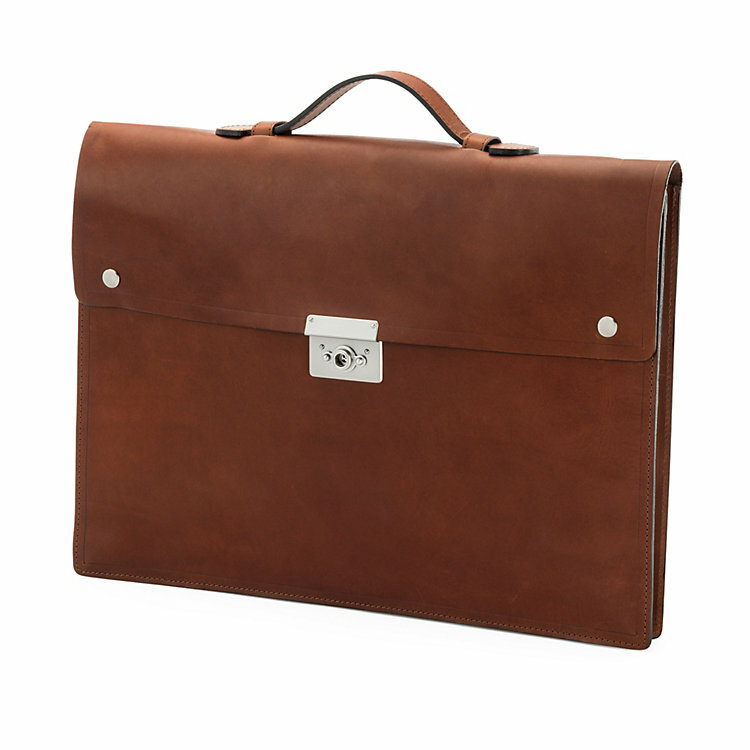 Briefcase or sheet music bag, or for documents in A4 format. If used as courier bag, once the delivery has been made, just fold it and carry it under your arm. All the leather edges have been sewn using a traditional saddler’s method. Outstanding Craftsmanship. Manufactum's Leather Collection. Our leather collection is created with the greatest attention to detail, from choice of leather to the very last stitch. The hides of English and Scottish cows are vegetable-tanned in England. This occurs in slowly rotating oak drums in a tanning liquor containing vegetable ingredients, each of which has a special effect on the tanned leather. Leathers. Superior in Use. Visually and Haptically Appealing. Functional criteria as well as aesthetic quality and texture determine the choice of leathers used to make belts, bags and small leather articles. Exceptionally tough, resistant ox leather, traditional, premium-quality cow leather, ultra-finely pored calf leather are used, but so are robust but soft elk leather, long-lasting yet fine, lustrous horse leather and also soft goat and deer leather. Case for MacBook® Pro 13"